﻿* Please note: We do not ship. This is available for local pickup or delivery. The Garibaldi or Garibaldi damselfish (Hypsypops rubicundus) is a bright orange fish of the damselfish family. This fish species is native to the North-Eastern subtropical parts of the Pacific Ocean, ranging from Monterey Bay, California, to Guadalupe Island, Baja California. The common name is a reference to the Italian military and political figure Giuseppe Garibaldi, whose followers often wore a characteristic scarlet or red shirt. Adult fish are a rich orange in color, whereas juvenile fish are redder and have many small blue spots. Adult Garibaldis tend to have a more opaque tail and dorsal fin. 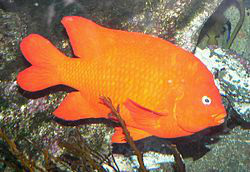 Garibaldis grow up to 38 cm (15 in) in length. Juveniles are not as bright in color and have iridescent blue spots which they lose as they become adult. They are found in water a few feet deep ranging to depths of up to 30 meters (100 ft), usually in association with reefs, and typically over rocky sea-bottoms. They feed mainly on invertebrates which they remove from the rocks. Adult Garibaldis maintain a home territory. The male clears a sheltered nest site within his territory, and the female then deposits eggs within the nest. The male subsequently guards the nest until the eggs hatch after 19–21 days. During this time period, the male Garibaldi aggressively tries to keep all other fish away from the very edible eggs. Like all male damsel fish, the male Garibaldi will boldly attack much larger swimming creatures, including humans, to the point of biting divers in order to try to drive them away from the area where the eggs are deposited. Froese, Rainer and Pauly, Daniel, eds. (2005). "Hypsypops rubicundus" in FishBase. November 2005 version. "Hypsypops rubicundus". Integrated Taxonomic Information System. Retrieved 11 March 2006. Jump up^ "Hypsypops rubicundus". IUCN Red List. International Union for Conservation of Nature. Retrieved 2011-07-29.